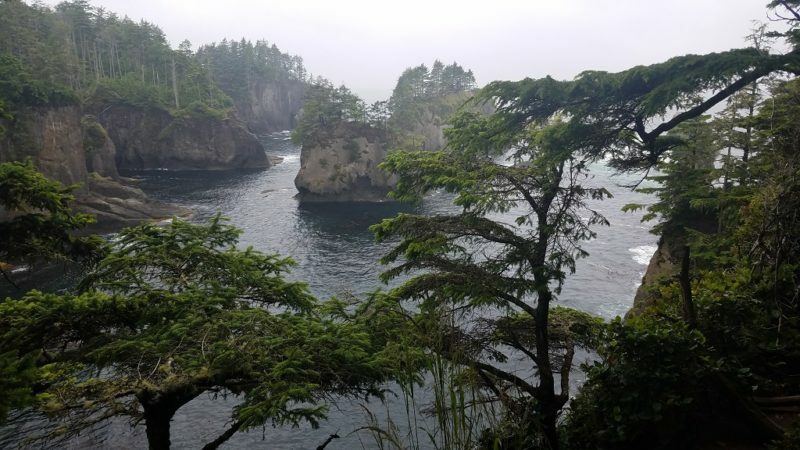 While I would love to do a post along the lines of “Top 5 Things to Do”, my trip this summer to the Olympic Peninsula focused on exploring the western side, the Coastal Olympic Peninsula versus the breadth of the entire 3,660 square mile Peninsula. And to be honest, one would need a couple weeks to do the whole peninsula justice, even on the most superficial of levels. I traded in my annual summer tradition of getting wacky at the Oregon Country Fair for a week of solace on the Peninsula. I have lived in Oregon for 21 years and have only made it up the eastern side of the Peninsula, which certainly possesses its own charm. But it is the least remote and to truly capture the spirit of the place, you really need to get inland and to the coast. From Portland to Neah Bay (the most northwestern corner of the Peninsula and of the lower 48 as well), is about 5.5 hours in a car. And although it seems counter intuitive, it is only an hour quicker from Seattle. Overall, once a place is more than four hours away, a vast majority of people won’t venture that far. Especially if they only have a weekend getaway. Since I wanted further assurance of finding solitude, I planned this trip to take place during the week. 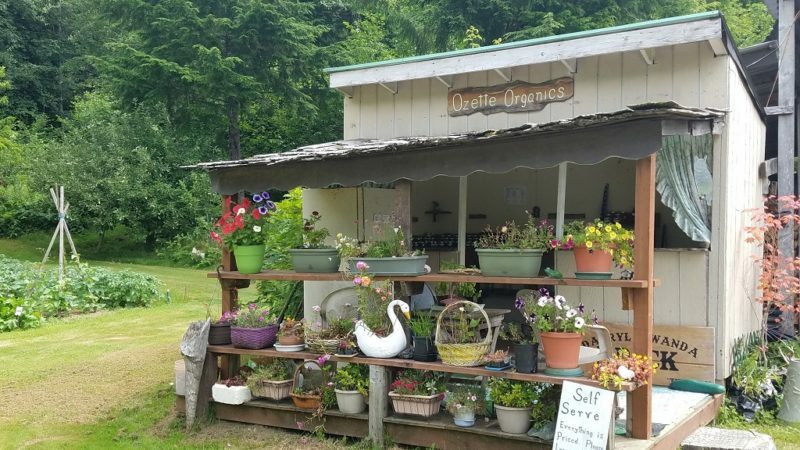 As you might expect, the Coastal Olympic Peninsula is mostly rural. A smattering of small towns are dispersed throughout, mostly concentrated on the exterior. Some are miss it if you blink, like La Push and Oil City. Some are outposts for outdoor adventure, but have no great appeal in and of themselves, like Forks and Port Angeles. And Port Angeles is where you would catch the ferry to Victoria BC, which I did two years ago. Some are cute and artsy and are worth a stop in their own right. Port Townsend has a counter culture vibe and attracts artists. Sequim is in the rain shadow of Mt Olympus and only gets sixteen inches of rain a year. The dry climate has allowed Sequim to blossom into the lavender growing capital of the region. Who would have thought? In fact, the weekend after I left, Sequim was hosting its annual lavender festival. A bit off topic, but I will mention my favorite things to do with lavender is make lavender crème brûlée. Just warm (not boil) the cream before adding the egg yolk with a couple tablespoons of lavender. Let it steep for 20 minutes (not more, it will make the cream bitter) and then strain. And then finish up your favorite crème brûlée recipe. The rainforest must be rainy – when should I go? It is true. If you have not been to a rainforest, you need to take the weather into account when you plan a trip. The rainforest can get up to twelve feet of rain a year! That is 150 inches. Compare that with about forty inches in Seattle or Portland, to get a sense of how quickly you will be turned into a drowned rat. However, the Pacific Northwest is blessed with dry summers, which means almost 100% of the rainfall happens in the other nine months. The lakes and rivers and ocean with the backdrop of towering spruce and hemlock trees make for a magnificent outdoor playground in the summer. Camping is abundant (although needs to be in marked places within the national park) and inexpensive. To be honest, Portland was having a heat spell and the thermometer was climbing to almost 100 every day. It was pure delight for me to take up residence where the days didn’t get above 75 and the nights were about 60. Temperate weather makes for a joyful temperament! I could totally envision a visit to the Coastal Olympic Peninsula in other seasons though. Late April and May, September and early October are the shoulder months that frame the dry summers. There are enough daylight hours to hike. And depending on the luck of the draw, some days, or parts of days, can be dry. And I would not even be opposed to a winter trip there. Cozy lodging and proper rain gear would be a must. And once those were in place, how cool would it be to venture into the mossy rainforest where the gnomes and fairies dance the hours away? 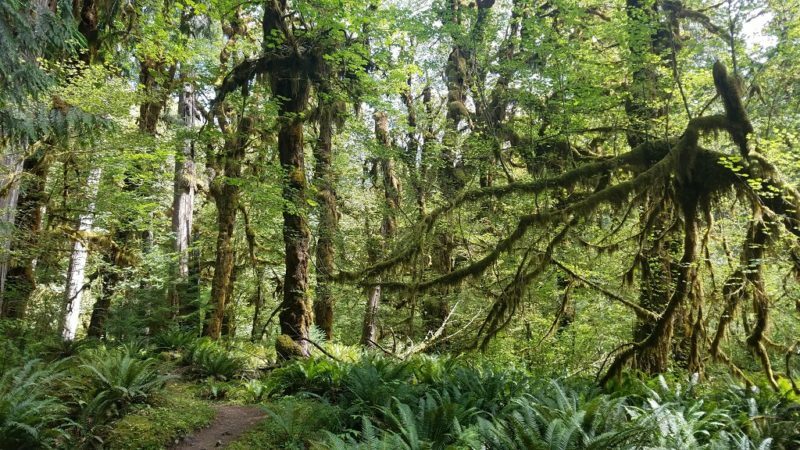 Even if you don’t currently believe in gnomes and fairies, hiking around Olympic National Park will turn you into a believer. As is the case with rural adventures, the food options are limited, both in number and in scope. Depending on where you are starting from, it is best to stock up on food in Olympia or Seattle or Portland. You can then cook as you go along or eat simple prepared foods. And there are enough convenience stores to fill in the gaps, if you need. 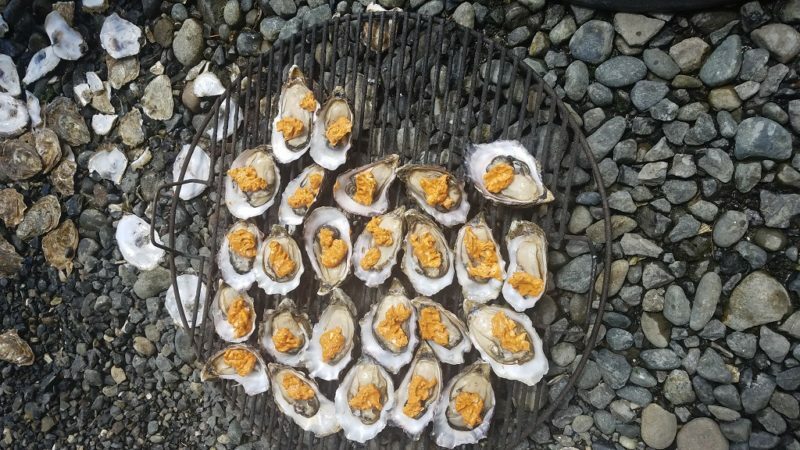 As a footnote to the limited food options on the western shore, I should note that Puget Sound oysters definitely qualify as foodie material. So, you may be able to indulge on your way to or from the shore. 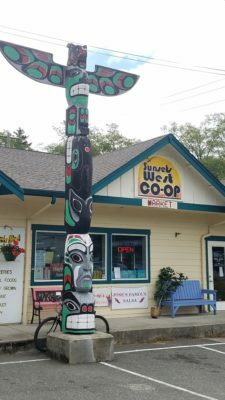 The Olympic Peninsula starts just north of Olympia, if you are heading north on I-5. Catch Highway 101 and soon you will be approaching the Puget Sound, the body of water in between the Peninsula and the mainland. I was up there this May for an oyster farm tour, at Chelsea Farms. I learned a tremendous amount about oysters. More importantly, I ate oysters until I could barely walk. Raw oysters, grilled oysters (with a sugar bourbon adobo pepper butter sauce), and geoduck were served as if they were going out of style. The geoducks are quite the delicacy and I was shocked to hear that one geoduck sells for about $50 retail. 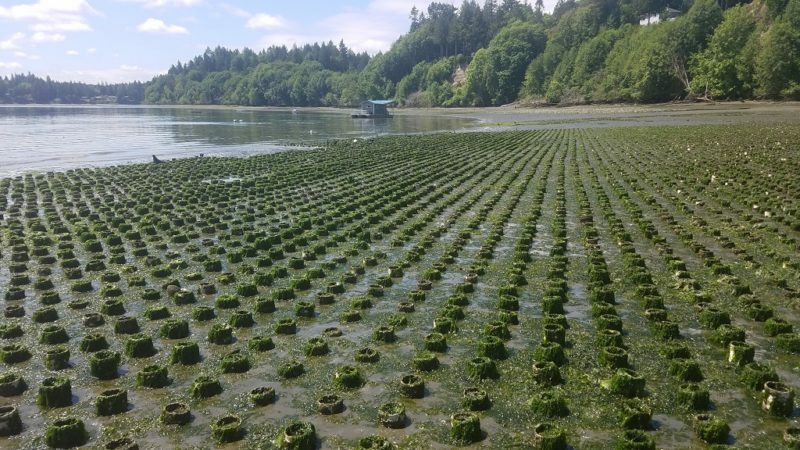 If you are near the Puget Sound, make sure to seek out those briny, sweet bivalves, and make them your dinner (breakfast works great too). I ate about 40 oysters at Chelsea Farms! 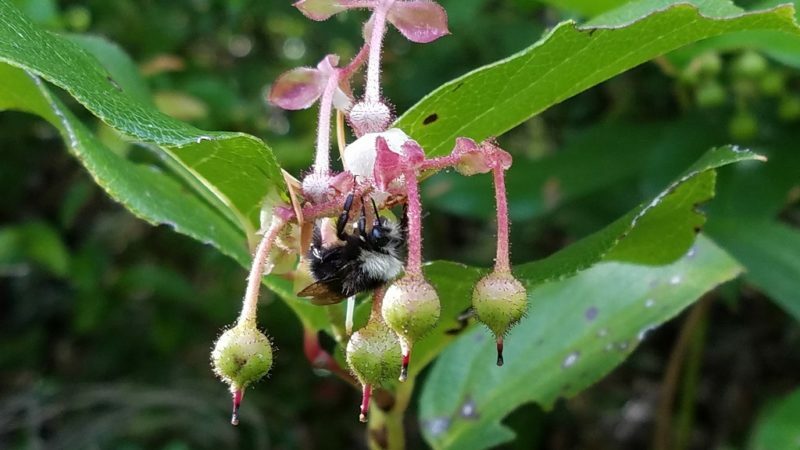 If you want to unplug, consider visiting these special locations in the Coastal Olympic Peninsula. . . . So, let’s go for a trip to the northwest corner of the most northwest corner of the continuous United States. Some refer to it as a gem. More specifically, I will declare it an emerald. Green, magical and rare. And certainly something to be cherished. The town itself is very modest. 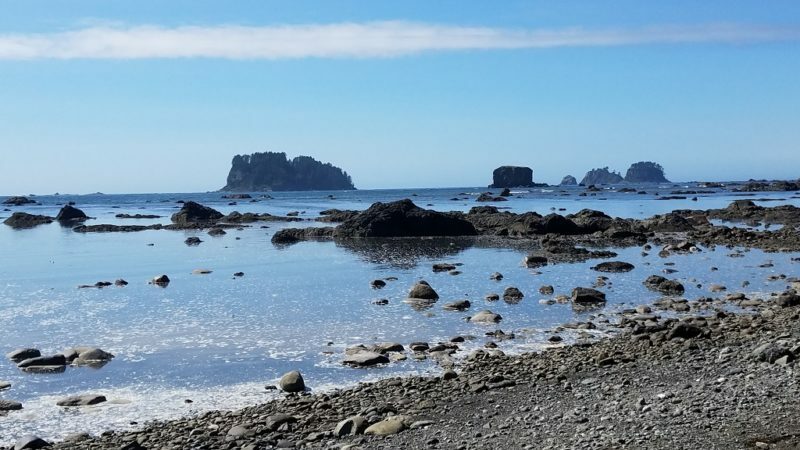 The land in and around Neah Bay belongs to the natives. If you camp on the native people’s land, please make sure to pay the fee to do so. The Makah Museum is a fascinating look into the lives of the natives, who thrived for centuries before white settlement. What was really interesting about the museum is that all the artifacts were unearthed from one archeological dig in Ozette. Years earlier, a mudslide had destroyed the native settlement by the lake (the downside of such a wet climate, prone toward this sort of natural disaster). Thousands of hours of diligent and careful labor were done to excavate the site. A plaque in the museum explains this, which is quite a story in and of itself. The tools and baskets and clothing are a reminder of just how abundant the natural resources in the region are. And more importantly, how native people used their knowledge to use the resources and live harmoniously with nature. 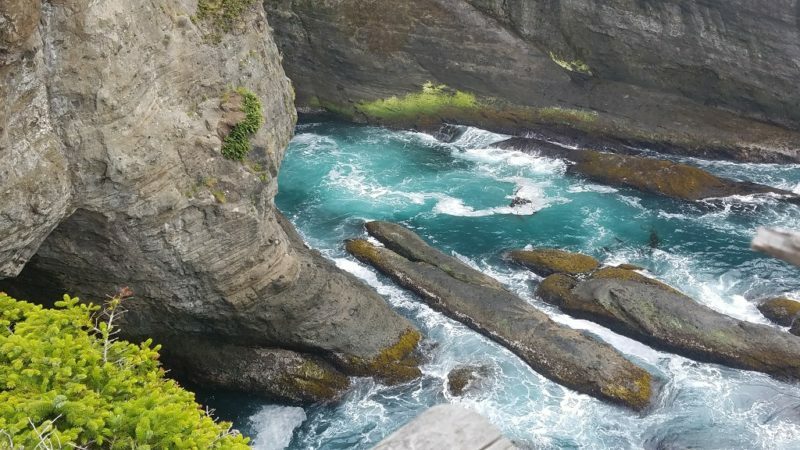 The must do hike of the area is Cape Flattery. The trail delivers you to the very tip of the peninsula. The rocks have taken a beating by the violence of the waves for many moons. The weakest rock eroded and the strongest rock remains. Any moment you are there, is merely a snapshot of this ever-changing landscape. The aqua colored water was reminiscent of the Caribbean and for a moment, looked inviting. But I promise you, the frigid Pacific Ocean is best enjoyed from afar. And do take your time to enjoy. There are a handful of lookouts from short spur trails along the way. Fifteen miles south of Neah Bay as the crow flies, Ozette is a small area nestled between the lake and the ocean. There are a couple campgrounds, one in the national park and one private one. Camping on the beach is permitted, but spots are limited and run out early. One must plan in advance to get a permit (which I did not do, so I did not camp there). I was a bit surprised I did not see water activities on the lake. But it did make me curious as to if boating was available in other spots on the peninsula. There are two trails that depart from the national park campground. They are each three miles from the ocean and if done as a loop, make for a slow and steady nine mile walk. The true prize is the three mile walk on the beach. Make sure to check the tide tables so that you can actually walk the beach. There is trail in the forest that parallels the ocean, if need be. But honestly, the coastline is so breathtaking, it would be a real bummer not to get up close and personal with it. Other than the points where the two trails met the beach (which is where camping is permitted), I saw one family on the entire three-mile stretch linking the trails. In Oregon, the most photographed spot on the coast is Haystack Rock near Cannon Beach. And deservedly so. For perspective, the entire stretch of this beach and probably beyond was full of “Haystack Rocks.” All sort of sizes and shapes dot the ocean floor. Hundreds of them. And at low tide, some of them are available to you to touch. The Olympic National Park is not one continuous piece of land. Most of it is inland (the rain forest) and some of it extends to the coast in a patchwork of beauty. The most popular beach is Rialto Beach. Catching a sunset will certainly be shared with a hundred or more of your closest friends, but it is worth it. Bundle up, it can get windy right on the coast in the evening! 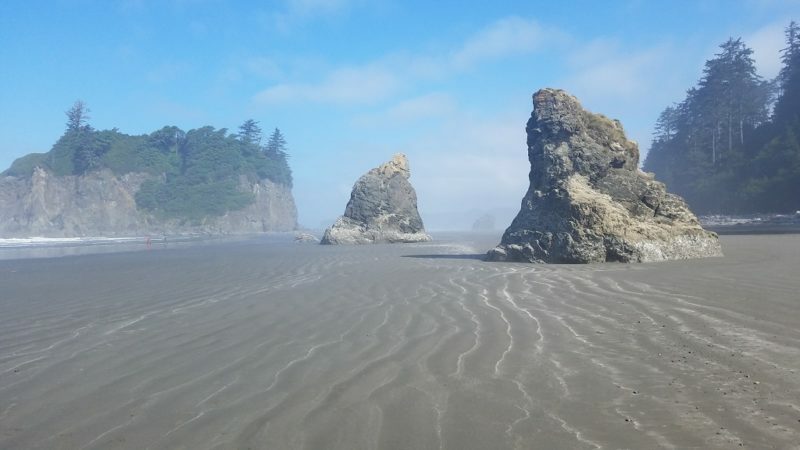 Other famed beaches are aptly named First, Second, and Third Beach, which run along route 110, an offshoot of Highway 101 near La Push. Let your taste for effort walking to the beach be your guide. Logic (and in this case, reality) dictates that the longer the walk to the beach is, the less people there will be when you get there. First Beach has the shortest walk and Third Beach has the longest walk. And for those of you who plan in advance, camping on these beaches is possible with permits in place. Ruby Beach is the ruby inset of the emerald Peninsula, how sweet. Ruby Beach is a spectacle of flecks of ruby like crystals in the sand. It is home to a sizable “Haystack Rock”. If the tides are in your favor, then go check out the big rock and look for tide pool creatures like sea urchins and starfish. Driftwood abounds and when there’s enough for a log jam, climbing on the driftwood brings out your inner child. 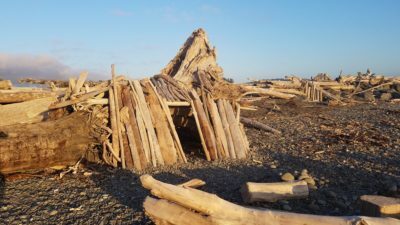 But be careful, the driftwood piles can be notoriously dangerous, especially when the tide comes in. 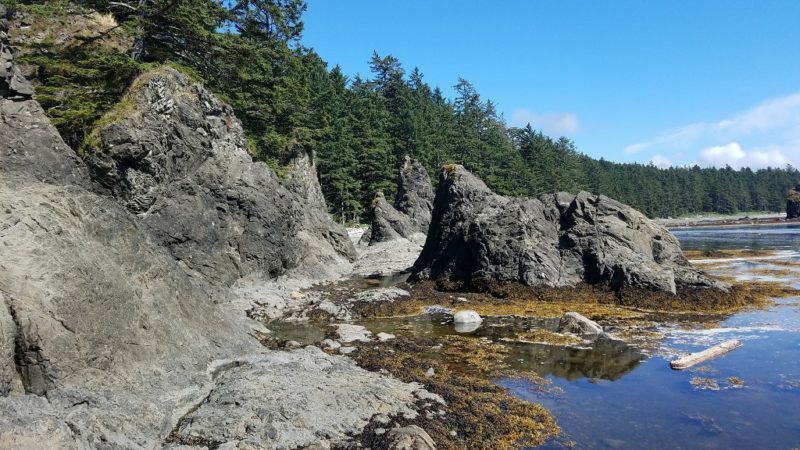 I turned my Ruby Beach experience into a longer hike. Essentially, I walked north on the beach until I greeted the Hoh River flowing into the Pacific Ocean. That makes for a natural place to stop and admire the scenery before backtracking. Click here to see the beached in action. 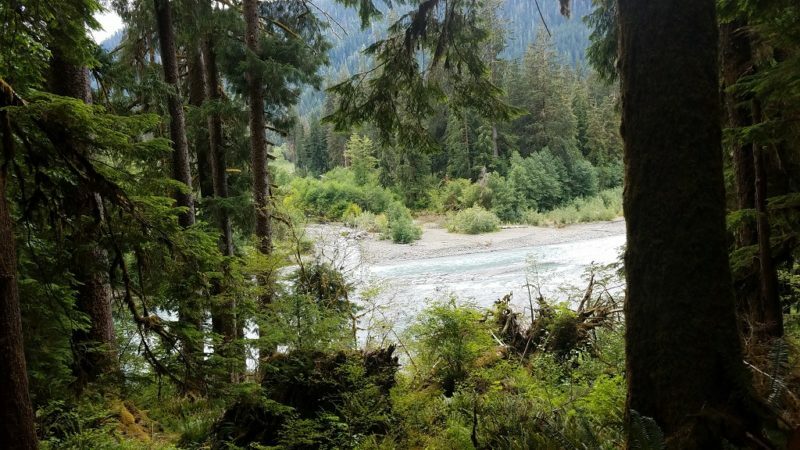 The Hoh River is named after the native tribe who called this rainforest home. You will officially enter the national park here when coming north. The purchased ticket is valid for one week. The visitor center is busy yet is worth a gander before hiking. There are a few short walks that depart from there, which are perfect for those who are short on time or ability, for a day or overnight hike. It is impossible not to be struck by the sheer size and majesty of the trees in the valley. And the way they coexist with the moss and lichen and shrubs assures us that the forest is more than a place for trees. It is a complex web of life, intertwined so strongly, that we can only begin to comprehend. 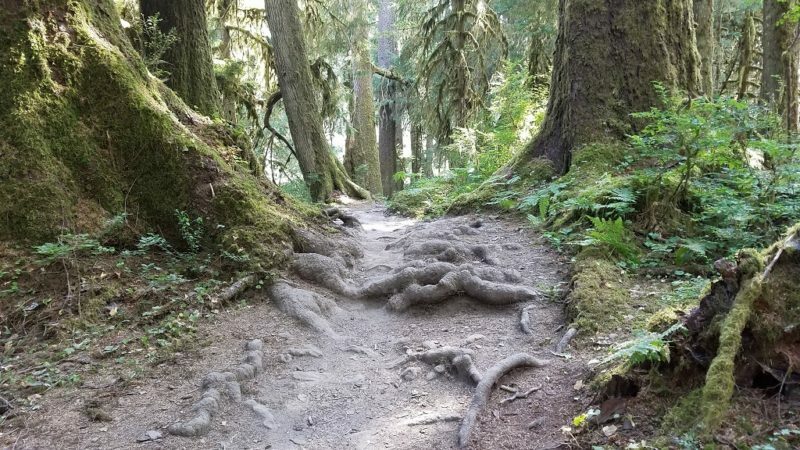 The Hoh River Trail is a well-worn route for backpackers. Seventeen miles each way and the prize is Glacier Meadows with breathtaking views of Mt Olympus. There is an island of sorts five miles in. Depending on water level, a sandy beach lays next the gurgling Hoh River. It makes for a perfect spot to dip your toes in the water, eat lunch and recharge, before heading back out. The terrain climbs gently, although I would call the round-trip a moderate ten-mile hike. Quinalt is a town that oozes charm. 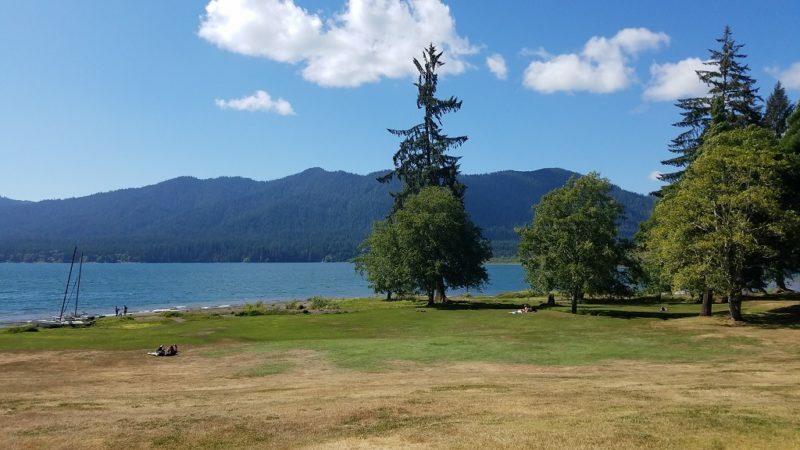 From the stately Quinault Lodge, to the pint sized Cultural Museum, to the namesake lake where recreational activities abound, I felt Quinault captures the spirit of what the Olympic Peninsula was long ago and what it is now. The native influence is modest, but do take note of the totem pole drawing adorning the back of lodge. The museum pays homage to the earlier settlers of the region. 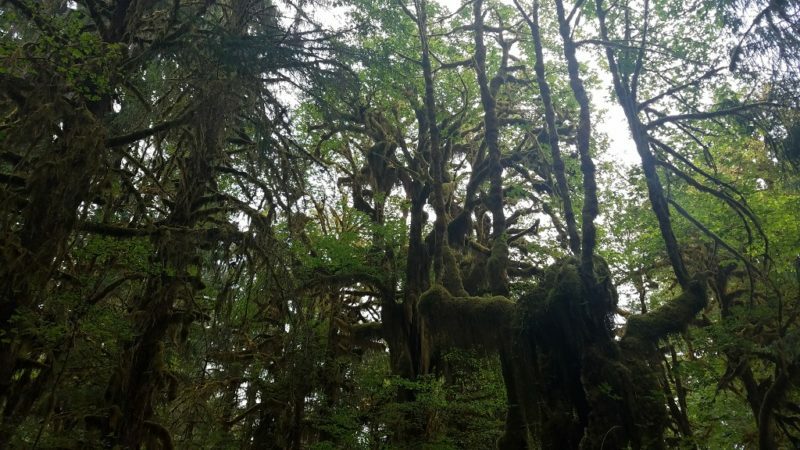 Like other parts of the west, you will see logging played an important role in the lives of those who called Quinault home. I was surprised, but maybe I should not have been that the sign in book had visitors from Paris and Amsterdam, just earlier that week. And this town, which is the southern gateway into the national park, has campgrounds galore. Some private and some public. There is a 31 mile loop that hugs the lake and lots of other trails that lead off into the forest. Waterfalls are prolific here, so if you have the time, drink in some of that magic. 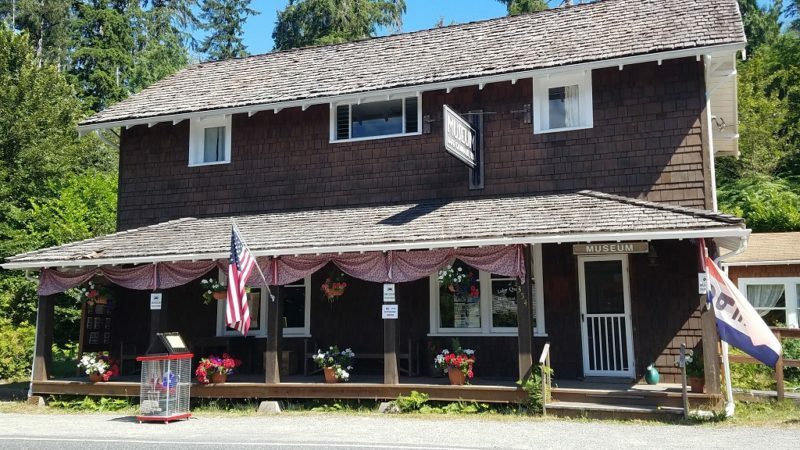 There are a few restaurants in Quinault. My one meal in a restaurant was at The Salmon House. The salmon was done just right (the side dishes left something to be desired). While I was hiking, I met folks from all over the country. And like I mentioned, I saw that visitors from Europe had been in Quinault and likely other parts of the Peninsula. 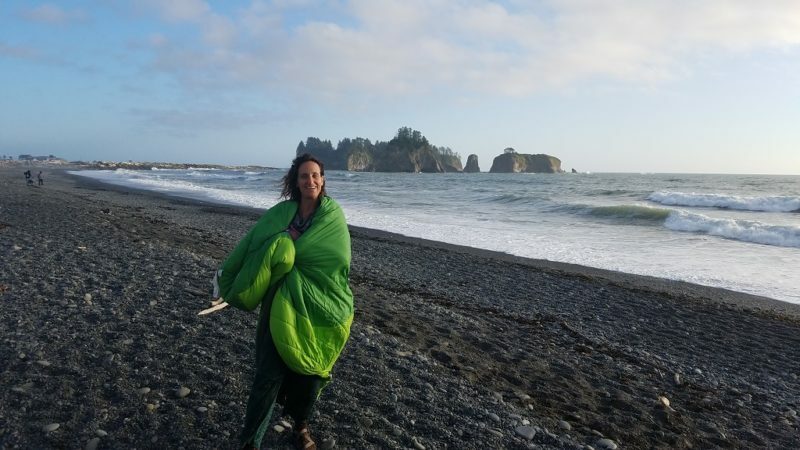 Thinking back, my sister and her husband took their honeymoon to Olympic National Park (they lived in NY at the time). So while west coasters can easily get access the Peninsula, it is clear that its appeal is wide enough to plan a visit here regardless of where you live. I went kayaking for a couple hours on the lake and it was pure splendor. The gentle waves of the midnight blue water helped carry me along my journey, although on the way back to the lodge, I was paddling against the current. The coniferous forests made for a continuous green belt around the lake and up into the mountains. Speaking of which, on my return, I admired Mt Olympus off in the distance. While I purely enjoyed my kayaking, I should mention others go out on the lake to fish. 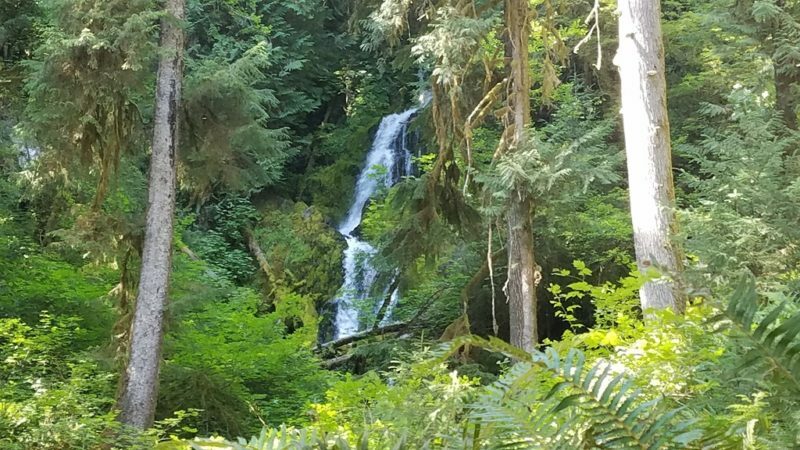 So, have I convinced you to come to the Coastal Olympic Peninsula to immerse yourself in the lushness of the emerald rainforest? I sure hope so! yes you’ve convinced me to come to the Olympic Peninsula! Nice post.